In our roles as leaders, how many times do we insist upon having the monopoly on "being right?" There are many who still attempt to practice the "it's-my-way-or-the-highway" leadership style, but in 21st century education it is anachronistic. As a leadership practice, it is fossil of a time when you could expect those "underneath" you to have less knowledge. You could expect that those whom you lead don't have the full picture that you have. That is reversed in a high-tech, twenty-first century world, where those who are "down the organizational chart" actually often know more than you do. In a information-rich, twenty-first century world, leaders can't ever expect to control the knowledge flow. It's simply a transparent, knowledge-flooded world and we, as leaders might as well get used to it. As Mark Adams indicates, "true courage" is being able to check your ego at the door just so you can see the bigger picture. Being a 21st century leader is being able to accept that you can't possibly know everything, and that perhaps you don't know as much as you thought you did. Courageous leaders today, do check their egos for the sake of getting the bigger picture. Leaders with true courage don't fight to be right; they fight to be open to the possibilities in a world in which they know their own limitations. How often do we as school leaders look at our schools with 21st century eyes? How often do we walk into classrooms within our building still caught up in our own 20th century views of what should be happening in those classrooms? I suspect it still happens quite often. We expect teachers to engage students in 21st century learning, yet we still give them classrooms where desks are arranged neatly in rows with a teacher desk located at the front of the room. Instead of environments that foster collaboration and teamwork, we have classrooms that drive students to compliance and teachers to rolling students through the assembly line like so many widgets. We talk big about preparing students for a 21st century world that requires students to interact globally and solve problems. Yet, our buildings and classrooms still sadly represent the 20th century factory model of pushing students through a system, adding value along the way to graduation. Our school schedules are still more about how we can most efficently churn students through the system, rather than finding ways to address the personalized needs of each student. We conduct quality control tests in the form of standardized tests along the way to make sure the product is progressing as we hoped. We do a lot of talking about preparing students for a world that does not yet exist, yet, if you examine our leadership decisions, it would seem that we still can't quite let go of the past. As we move into the end of another school year, perhaps it is time to begin questioning what we do. With an incredibly open mind, perhaps we need to begin seeing what we do with 21st century eyes. The Obama Administration announced its latest plan today that would tie federal funding of teacher preparation programs to test scores. Duncan and the Obama Administration are seeking to place the federal government in the middle of teacher preparation. I suspect this measure will only make it more difficult to convince young people to become teachers and educators, and it will likely have some perverse affects on teacher preparation in this country just as the use of testing for high stakes decisions has had on schools and classrooms. On closer examination, this proposal contradicts research, logic, and common sense. There is no evidence that using high stakes tests as a means to improve teacher preparation programs will work. There is plenty of evidence that using tests (as has been done under NCLB and Race to the Top) to make high stakes decisions has had quite a few unintended consequences in schools and classrooms. These consequences have included things like the over-emphasis on test-prep, teaching to the test, narrowing the curriculum to test content, cutting of arts programs, use of programmed instruction, and cheating, among many others. One can only imagine what those effects will be on teacher preparation programs when tests are used to determine continued federal funding. For example, teacher candidates will now perhaps be well-versed in things like test-prep and teaching to the test, as opposed to engaging students in authentic instruction. Perhaps teaching candidates can also learn how to narrow the curriculum so that it focuses only on what is tested . The effects of using high stakes testing to make high stakes decisions is well-documented in the research, and adding testing stakes to teacher preparation will most likely affect those programs in adverse ways just as it has in schools and classrooms. Surprisingly, the Obama administration's idea of tying test scores to teacher preparation programs comes even after the American Statistical Association recently stated that value-added formulas should be used with caution, because teachers only account for less than 15 percent (or even less in some studies) of the variability in test scores. In other words, most of what happens in the classroom is beyond a teacher's control. Perhaps the Obama administration is still looking to find "Superteachers" as John Kuhn has called them who are capable of performing miracles. Unfortunately, I am afraid there are so few, if any, especially in an environment, which his policies have created, that is so hostile to teachers and the education profession in general. The important tenet of accountability is that you hold individuals accountable for that which is in their direct control. This policy violates that tenet in many ways. Many state tests aren't of high enough quality to be even considered for using in this high stakes manner, and the use of commercial tests like ACT and SAT makes little sense because they haven't been designed for this purpose. Add the fact that, once again, there are entirely too many teachers not subject to test scores. That's the same issue with his Race to the Top and NCLB waiver policy. State tests were mostly designed to tell what students know, not tell how well teachers are teaching. Once again, Arne Duncan and the Obama administration are pushing for using tests in still another way for which they weren't designed. This new policy of using test scores to evaluate teacher prep programs should also have some interesting implications in practice. I could easily see this policy exacerbating the problem of getting good teachers in high needs schools. In addition, I could also see this policy affecting which school's graduates choose to teach in as well. It's common sense. Are you going to select teaching in a school where test scores are abysmally low, and your job is to somehow miraculously to raise them? As a teacher prep program, are you going to encourage your graduates to teach in schools with historically low test scores? Perverse education policy often brings about perverse practice. As this Politico article points out, Duncan is expecting a great deal of opposition to this latest plan, (See Barack Obama Cracks Down on Poor Teacher Training.) How could he expect things to be different? Educators and parents grow tired of all the testing and emphasis on testing. What will be more interesting to see is whether he and the rest of the Obama Administration will be willing to listen to educators on this matter. Sadly, the history of this administration and Arne Duncan probably provides that answer even as I ask the question. Since the dawn of No Child Left Behind all the way through the Obama administration’s signature Race to the Top program, finding school administrators willing to criticize these federal programs and what they've done to public education is often difficult. As Kuhn points out, smart administrators “don’t poke hornets’ nests with sticks,” because it isn’t the smartest thing to do politically, but that is exactly what Kuhn does in his book, Fear and Learning in America: Bad Data, Good Teachers, and the Attack on Public Education. He takes on, with wit, energy, passion, and solid logic all the current education reforms that seem to be directed toward tearing down the teaching profession and public education brick by brick. According to Kuhn, this anti-public education agenda began all the way back when the media, policymakers, politicians, and even educators uncritically accepted the problems with public education outlined in the Reagan-era education report, A Nation at Risk. This report set our nation on its current path of education deform because no one critically questioned its broad negative declarations about public education in the United States. As pointed out in Kuhn's book, this report "spurred a rising tide of negative reports" that were often accepted entirely at face value and uncritically, often, even by the educational establishment. Throughout Fear and Learning in America Kuhn repeatedly takes on these education reform measures and those pushing them. He takes on the obsession with standardized testing in this country and the use of what he calls "standardized junk science" or the use of value-added measures to evaluate teachers. Kuhn also points out that "At some point education reformers stopped asking teachers to be accountable for quality teaching and started asking them to be accountable for miracles" and that the current reform movement powered by "policymakers, journalists, and think tank wonks embraced the pursuit of superteachers as a way to fix schools, and, ipso facto, society." This "pursuit of miracales" as Kuhn calls it, has left teachers with three choices all bad: "perform miracles, fail, or cheat." John Kuhn's book Fear and Learning in America is both entertaining and informative. He disperses anecdotes throughout the book that communicate the often unforgotten and human side to what this current reform agenda has done to our schools. He describes how all these measures have ultimately placed public education in America in "The Educational Dark Ages" where there are those well-meaning reformers who are pushing change out of noble intentions, but there are also those pushing these reforms who have more sinister and self-serving agendas. He goes on to point out that current educational reformers have conveniently discarded poverty and all other achievement-influencing variables because they have been deemed either off limits or too difficult to tackle. Unlike some of the current books examining the anti-public education sentiments in the United States, Kuhn does not just passionately detail what's wrong with current education reform; he offers at the end of the book his own ideas on what can be done to improve education in America for all students. These all stand in contrast to the current educational reform agendas being pushed by state and federal policymakers and politicians. 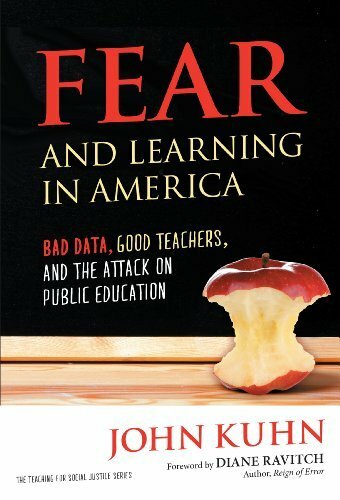 I have read several books that examine this American phenomenon of attacking public schools, but Kuhn's book, Fear and Learning in America: Bad Data, Good Teachers, and the Attack on Public Education is one of the best yet! It's readable, entertaining, and passionate style make it both a page turner and an inspiration for any educator interested in the current state of public education. Last summer, our North Carolina Legislature handed all our state school administrators a hand grenade with the pin pulled. Under a law that they passed, school districts were tasked with finding a way to identify the "top 25%" of all teachers. The law did not specify how this identification was to be done, but it mandated that districts offer bonuses to whoever was identified as the top 25% of teachers in the schools. Then, those who accepted these bonuses were to automatically lose their tenure and be immediately placed on contracts. The problem, as many districts quickly discovered, lay in trying to find a way to equitably identify this top 25 percent. You can't use just test scores because so many subject areas are not subject to testing. When it comes to other characteristics of teaching, how could you possible quantify and narrow down who falls in the top 25% category and not inadvertently and arbitrarily leave someone out who deserves the designation too? Some districts have struggled with trying to find a way to implement this impossible law, often wasting a great deal of man hours implementing what clearly has to be one of the most ridiculous laws passed during last year’s session. While the injunction blocking its implementation makes a great deal of sense, what is amazing from the WRAL story is how quickly Senate President Pro Tem Phil Berger spokesperson Amy Auth tried to spin this as efforts by government bureaucrats "to deny top-performing teachers from receiving a well-deserved pay raise." What Ms. Auth apparently doesn't quite get is that the lawsuit wasn't brought on by bureaucrats; it was brought by a group of concerned educators and baord members as well as others who saw how ridiculous and impossible this law was to implement in the first place. Phil Berger has demonstrated he does not respect teachers and educators, and for his spokesperson to pretend to have the least bit of concern for teachers is beyond belief. Under Phil Berger and Thom Tillis’s legislative leadership and with NC Governor Pat McCrory’s endorsement, North Carolina education suffered greatly last year. This North Carolina Legislature has worked extra hard to pass many of the American Legislative Exchange Council's (ALEC) laws. It is no secret that this legislature, Phil Berger, Thom Tillis and Governor Pat McCrory are do not appear to be friends to public education and to educators, and no amount of spin is going to hide that. There is no doubt that Pixar is one of the most creative companies in the world today. They have accomplished an "insanely great feat" by creating the first all computer animated feature film, Toy Story, at a time when naysayers were telling them it couldn't be done. Since then, they have created a series of computer-animated films that have thrilled kids and adults every where. One of my own most memorable times was sitting in a theater watching Finding Nemo and Cars with my toddler son. What exactly does it take to foster the kind of organizational culture that is capable of doing what nobody else is doing? How can companies, schools and non-profit organizations create what Ed Catmull and Amy Wallace, the authors of Creativity Inc: Overcoming the Unseen Forces That Stand in the Way of True Inspiration, call a "sustainable creative culture?" Catmull and Wallace tackle that very task in this book with a rare combination of both narrative and common sense. Catmull begins this book by telling his and Pixar's story, and a fascinating story it is. He describes the company's rise from a part of George Lucas's film company, Lucasfilm, through their partnership with Steve Jobs, to the present day as a company that churns out computer-animated films to anxiously awaiting audiences world-wide. 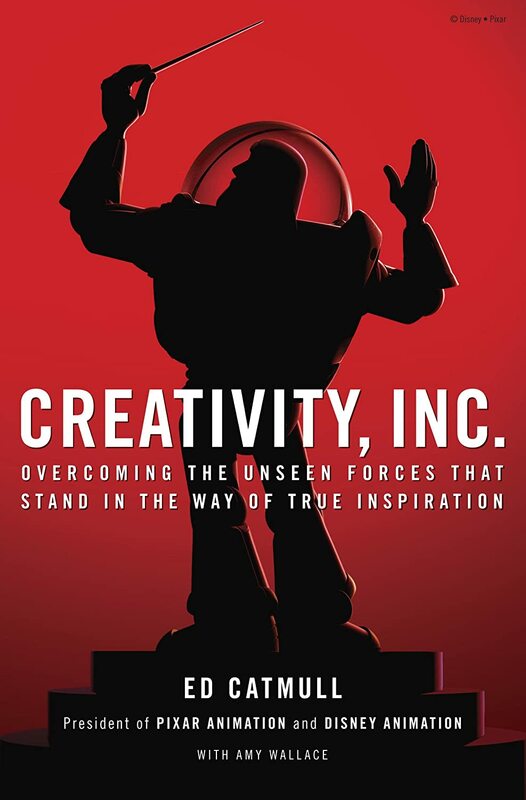 Catmull's anecdotes and stories throughout the book remain true to one of his own philosophical beliefs about his business: creativity is about the story, and in this book he tells an engaging one for those fascinated with creativity and how it might be fostered within an organization. In addition to the Pixar story, Catmull and Wallace also provide valuable insight throughout the book on how Pixar has been able to maintain its creative edge through the years. For example, Catmull insists that creative cultures must operate with transparency and candor. People who work in those cultures must have the freedom to speak their minds and feel that what they say matters. That's perhaps common sense to some leaders, but many seem to forget that, especially in the "top-down" reform environment we have in public education today. Catmull provides a valuable list of "Starting Points for Managing a Creative Culture" in back of the book. These "starting points" are referred to repeatedly throughout the book as Catmull and Wallace tell Pixar's story. What are some of these "starting points?" "When looking to hire people, give their potential to grow more weight than their current skill level. What they will be capable of tomorrow is more important than what they can do today." "If there are people in the organization who feel they are not free to suggest ideas, you lose. Do not discount ideas from unexpected sources. Inspiration can, and does, come from anywhere." "There is nothing quite as effective, when it comes to shutting down alternative viewpoints, as being convinced you are right." This list of "starting points" by Catmull is extensive. They touch on subjects such as inviting failure and risk in the company or organization. Engaging the whole company is fixing problems is another one. From a leadership perspective, this list is truly a great starting point for fostering creativity in your organization. "How can we create a sustainable creative culture capable of tackling our most serious problems?" Creativity Inc: Overcoming the Unseen Forces That Stand in the Way of True Inspiration is a book I see myself pondering and thinking about for some time. It is an outline for maybe getting your school or district, or company for that matter, on the road to creativity. As a leader, I am seriously pondering ways I can foster Catmull’s wisdom on creating a sustainable creative culture within my school. As a high school principal of a non-traditional high school, I see much of the wisdom of this book having the potential to transform schools and school districts into places where creativity rather than conformity thrives. Catmull's and Wallace's book is easily one of the most engaging and thought-provoking books I have read this year. Raise beginning teacher pay and not raise the pay of any other teachers. Future raises for any teachers should be performance-based or merit pay tied to test scores. The General Assembly should direct the North Carolina State Board of Education to study educator compensation models and submit recommendations to the General Assembly AFTER this fall’s legislative elections. Finally, recommend another study, this time by passing the buck the North Carolina State Board of Education. Of course this passing the buck was by design due to their own earlier law. Isn't it really interesting though that the State Board of Education is to REPORT BACK AFTER THE NOVEMBER ELECTIONS this fall? You can certainly read much into that move! There’s absolutely nothing in their findings that wasn't out there and already being discussed. Meanwhile, North Carolina is hemorrhaging teachers who are seeking greener pastures elsewhere, and there are so few teachers graduating from colleges to replace them. In addition, morale for teachers in this state has never been lower, and all our state leaders can do is study so that they can again study the studies? This is all due to a legislature, who at least judging by their actions and appearances, absolutely detest public education. Some other interesting things coming out of this exercise in political pointlessness, were the comments made by some of the teachers on the task force. It is clear that our North Carolina Legislature continues to predictably be no friend to public education. After passing a slate of legislation all designed and directed toward dismantling the teaching profession, it isn't really surprising at all that nothing substantive comes out of this North Carolina Legislative Task Force on teacher pay. Our state political leaders have certainly remained steadfastly dedicated to their anti-public education agenda, and they are counting on kicking this "teacher pay can" down the road past this fall’s elections. UPDATE: Read WRAL's article here "Teacher Pay Report Gets Chilly Reception" and also you can read the Legislative report here: "NC Educator Effectiveness and Compensation Task Force Report." What does it take to create a “sustainable creative culture,” in an institution like public schools? The fact that many public schools exist just as they did a hundred years ago is an indication that they are often more about self-preservation than engaging in innovation. In other words, school systems are more often interested in work that is derivative rather than innovative. Not much is new in education reform because of this. It is a monumental failure to create a "sustainable creative culture" that could tackle some of our most serious problems in education today. “If you’re in education long enough, you’re likely to get hit by the same pendulum multiple times." According to Catmull, a most important ingredient in this creative culture is fostering a place where “people feel free to share ideas, opinions, and criticisms.” To create that culture, school leaders need to embrace “candor.” Candor is defined as the “quality of being open and honest in expression; frankness.” Candor, in other words, is inviting others to be open about their opinions, criticisms, and ideas. Sadly, public education, for all its calling for stakeholder buy-in is often more about defending and marketing someone’s pet reform project or idea rather than honestly seeking other educators' input or opinions. This is why that education pendulum continues to hit us multiple times. Candor is not invited and is often not allowed. If we really want to move education initiatives beyond the derivative to the innovative, then education leaders need be courageous and invite candor into their schools and districts. How can school leaders invite candor into their schools and districts? Catmull offers an easy way to do that: You “institutionalize candor” so that it is part of the ritual and practice of the school. You can begin this by engaging in three simple practices. Tear down the “top-down hierarchy” and top-down reform driven processes that currently exist, and stop trying to defend initiatives that, if they are so darn beneficial, they should stand up to criticism and candor on their own. Too often educational leadership is more about pushing and marketing ideas instead of approaching the problems we face in schools creatively. Instead, let’s subject all these educational initiatives to the full force of candor and criticism. If they survive intact, then they must be good. If not, then they weren't worth the paper on which they're written. Invite straight talk as a rule. Nothing is sacred and off limits. Too often, those sitting in meetings are afraid to speak their minds because of the political consequences. It’s true! In public education if you get the reputation of speaking your mind, you are often defined as “not a team player” or worse. You are cast aside as an outcast and troublemaker. Educational leaders like to talk big about buy-in, and that they sought feedback, but some of them politically destroy those who don’t agree with them. Candor means you have the guts to listen to criticism and recognize when it is valid. Bring people together often to discuss school or district initiatives for the purpose of straight talk. Educators, for the most part, are by nature passionate people who care a great deal about what they do. Encourage them to identify the problems they see and be entirely candid. School leaders must be willing to courageously listen and not resort to being defensive. Allow the discussion and criticism to happen instead of shutting it down. Be flexible and willing to revise accordingly, and possibly even let go. It should never be about ego; it should be about improving education for kids. I wish that I could be as optimistic about the education reforms swirling about---Common Core, Technology, Testing, Accountability, etc. Sadly, I am not. Fundamentally, public education is still more about institutional self-preservation than engaging in creative approaches to the problems the system faces. If we’re going to move to sustaining a creative culture that can tackle 21st century issues, then we have to become courageous school leaders and invite candor into our schools and districts. Blogging is a way for educators to publish their ideas, connect with other educators and engage in audiences from around the world. 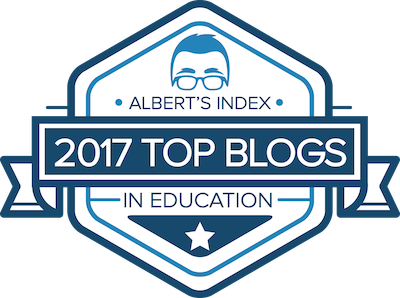 As a self-publishing platform, blogs allow educators to share their ideas easily with other educators. For example, as an administrator, I often share how our school approaches a particular problem. Recently, in a blog post I shared how our school deliberately chose to not use regular classroom desks and instead chose to use movable tables to facilitate collaboration. As a networking tool, a blog can connect educators with others around the world. Recently, through my blog, I connected with an educator in South Africa who wanted to ask questions about a blog post I had done earlier in the year. I have also connected with educator authors as well. 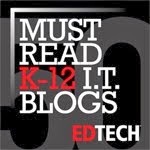 Finally, blogs give educators the potential to engage a global audience of educators. 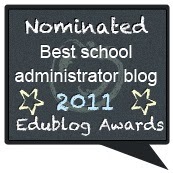 I have connected with educators on all continents through my blog posts. The world truly becomes a much smaller schoolhouse. Recently, I shared much of this information in a presentation with my doctoral class. Here's that Google presentation entitled "Blogging for Real: Publishing, Connecting, and Engaging in World-Wide Audiences." Revisiting Test Pep Rallies in a Season of Testing: Good Practice, Waste of Time, or Bad Ethics? In 2011, I explored the topic of "Test Pep Rallies" in a blog post entitled "Test Pep Rallies: Good Practice or Waste of Time". With the advent of Race to the Top and the Obama administration's education policy forcing states to elevate standardized tests to even higher stakes, I wondered if the practice had become even more prevalent. I again did a quick search for research on the topic, and as far as I can tell, no studies of whether the practice even affects student achievement exist. Still, though, the Test Pep Rallies continue and in some cases have become part of celebrated school culture and tradition. In New York, a "Rock the Test" rally has gotten bigger over the years and continues strongly. PS 55 recently held its "Rock the Test" rally on March 31. (See "Pep Rally Readies PS 55 Students to 'Rock the Test' as They Begin State Exams.") However, the message seems to be a bit different. The principal of PS 55, Sharon Fishman states "The message to students and parents should be that this is just a test; no matter how they do, it's not the end of the world." Still, the school talks about "psyching students up the test" while at the same time talks about calming students' nerves and helping them deal with stress. These rallies continue in other states too. In Nebraska, Elkhorn Elementary also had a Test Pep Rally on March 28 to "Fire Up Kids for the Test." This school goes so far as to compare "getting ready for the test" to "getting ready for the big game" and even brought former Nebraska football players to remind students that "the test is their game." A local TV station WOWT joined in as well to get students pumped for the state tests. All over the country, schools are still holding “Test Pep Rally Events” obviously with the hope that these events will somehow have a positive effect on student achievement scores, even though there is still absolutely no evidence that such practices work. I just can't help but wonder if there are other educators like me who see these practices as harmful and downright unethical. Since my 2011 post about Test Pep Rallies, my big question now is "Why have we allowed our culture of education come to a point where tests even deserve this kind of emphasis?" This practice of using "Test Pep Rallies" has to be one of the most bizarre rituals to come out of the testing and accountability culture yet! In my original 2011 post I raised a series of questions about Test Pep Rally use that I think is even more pertinent in today's even higher-stakes testing atmosphere. How does holding a Pep Rally over-emphasize the test's importance? Does not this practice buy in to the idea that "only the test matters?" It would seem that Test Pep Rallies only reinforce a school cultural idea that one's value is determined by a test. Is that a message we want to send to kids? How does holding “Test Pep Rallies” foster a culture where “teaching to test” is expected and the norm? It would be interesting to see if these schools holding these rallies are dominated by school cultures where the teaching that occurs focuses mostly on the test, and that the de-facto curriculum is actually the test content. But even if they aren't, what is the hidden message about tests we are sending kids with these kinds of events? Do these “Test Pep Rallies” work as intended? Do they even affect test scores? Even if one buys into the idea of elevating of test scores to this level, does that mean having these rallies raise test scores? There's no evidence of this at all. How has the use of Value-added teacher evaluations affected the frequency of these test pep rallies? One would suspect as our education system places even higher-stakes on testing, the occurrence of these test pep rallies will increase, taking even more valuable time away from learning. Do these Test Pep Rallies foster a culture that trivializes learning and makes standardized tests the focus of all learning? This question of course depends on what your definition of learning is. If it's a test score, then the answer is no. If the answer is yes, then perhaps you see learning as more than a test score. There is something about this practice that seems demean learning and what we're about as educators. I still have no doubts that administrators and teachers who hold “Test Pep Rallies” really mean well, and that this practice is one of many practices where schools are trying to adapt to politics that place testing on an undeserved pedestal. Yet, it is even more important today that school leaders avoid falling into the “do-whatever’s-necessary-to raise test-scores” trap. In the end, do we really want to give imperfect tests that kind of weight in our students’ lives? The answer to that is not a question of effectiveness. For me it was a question of ethics 3 years ago, and it is even more so today. Lawsuits against states using value-added models in making teaching evaluation decisions has begun in earnest. There are now three lawsuits underway challenging the use of this controversial statistical methodology and the use of test scores to determine teacher effectiveness. This increase in litigation is both an indication of how rapidly states have adopted the practice, and how these same states failed to address so many issues and concerns with the use of VAMs in this manner. Two lawsuits have now been filed in Tennessee against the use of value-added assessment, known as TVAAS as a part of teacher evaluation. The first lawsuit was filed against Knox County Schools in Tennessee by the Tennessee Education Association on behalf of an alternative school teacher who was denied a bonus because of her TVAAS ratings. (See “Tennessee Education Association Sues Knox County Schools Over Bonus Plan” ) In this case, the teacher was told she would receive system-wide TVAAS estimates because of her position at an alternative school, but 10 of her students were used anyway in her TVAAS score, resulting in a lower rating and no bonus. This lawsuit contests the arbitrariness of TVAAS estimates that use only a small number of teacher’s students to determine overall effectiveness. In the second lawsuit, filed also against Knox County Schools, but also against Tennessee Governor Bill Haslam, state Commissioner of Education Kevin Huffman and the Knox County Board of Education, an eighth grade science teacher claims he was also denied a bonus unfairly after his TVAAS value-added rating was based on only 22 of his 142 students. (See “TEA Files Second Lawsuit Against KCS, Adds Haslam and Huffman as Defendents” ) Again, the lawsuit points to the arbitrariness of the TVAAS ratings. A third lawsuit has been filed in Rochester, New York by the Rochester Teachers Association alleging that officials in that state “failed to adequately account for the effects of severe poverty, and as a result, unfairly penalized Rochester teachers on their Annual Professional Performance Review” or yearly teacher evaluations. (See “State Failed to Account for Poverty in Evaluations”). While it appears that this Rochester suit is disputing the use of growth score models not value-added, it also challenges the whole assumption and recent fad being pushed by politicians and policymakers of using test scores to evaluate teachers. North Carolina jumped on the value-added bandwagon in response to US Department of Education coercion, and now the state uses its TVAAS version called EVAAS, or Educator Value Added Assessment System as part of teacher and principal evaluations. Fortunately, no districts have had to make high stakes decisions using the disputed measures so the lawsuit floodgate hasn't opened in our state yet, but I am sure once EVAAS is used to make decisions about employment, the lawsuits will begin. When those lawsuits begin, the American Statistical Association has perhaps outlined some areas of contention about the use of VAMs in educator evaluations in their ASA Statement on Using Value-Added Models for Educational Assessment. Here’s some points made by their position statement that clearly outlines the questions about the use of VAMs in teacher evaluations, a highly questionable statistical methodology. “VAMs (Value-added models) are complex statistical models, and high-level statistical expertise is needed to develop the models and interpret their results.” States choosing to use these models are trusting third-party vendors to develop them, provide the ratings, and they are expecting educators to effectively interpret those results. Obviously, there’s so much that can go wrong with the interpretation of VAM results, the ASA is warning that there is a need of people who have the expertise to interpret those results. I wonder how many of these states who have implemented these models have spent time and money training teachers and administrators to interpret these results, other than subjecting educators to one-time webinars or "sit-n-gets"? “Estimates of VAM should always be accompanied by measures of precision and a discussion of the assumptions and possible limitations of the model. THESE LIMITATIONS ARE PARTICULARLY RELEVANT IF VAMS ARE USED FOR HIGH STAKES PURPOSES (Emphasis Mine).” I can’t speak for other states, but in North Carolina there has been little to no disclosure or discussion about the limitations of value-added data. There’s been more public relations, advertising, and promotion of the methodology as a new way of evaluating educators. They even have SAS promoting the methodology for them.The Obama administration has done this as well. The attitude in North Carolina seems to be, “We’re gonna evaluate teachers this way, so deal with it.” There needs to be discussion and disclosure about SAS’s EVAAS model and the whole process of using tests to evaluate teachers in North Carolina. Sadly, that’s missing. I can bet it’s the same in other states too. “VAMs are generally based on standardized test scores, and do not directly measure potential teacher contributions toward other student outcomes.” In other words, VAMs only tell you how students do on standardized tests. They can’t tell you all the other many, many ways teachers contribute to students’ lives. The main underlying assumption with using VAMs in teacher evaluations is that only test scores matter, regardless of what supporting policymakers say. While its true that the North Carolina Evaluation model does include other standards, how long will it take administrators and policymakers to ignore those standards and zero in on test scores because they are seen as the most important? The adage, "What gets tested, gets taught!" is true and "What get's emphasized the most through media and promotion, matters the most" is also equally true. When standard 6 or 8 is the only standard on the educator evaluation where an educator is "In Need of Improvement" then you can bet test scores suddenly matter more than anything else. “VAMs typically measure correlation, not causation: Effects---positive or negative---attributed to a teacher may actually be caused by other factors that are not captured in the model.” There are certainly many, many things----poverty, lack of breakfast, runny noses---that can contribute to a student’s test score, yet there’s a belief that a teacher directly causes a test score to happen, especially by those pushing VAMs in teacher evaluations. The biggest assumption by those promoting VAMs in teacher evaluations is that the teacher's sole job or part of their job is the production of test scores. In reality, teaching is so much more complex than that, and those reducing it to a test score have probably not spent much time teaching themselves. “Most VAM studies find that teachers account for about 1% to 14% of the variability in test scores, and that the majority of the opportunities for quality improvement are found in system-level conditions.” Yet in most states, educational improvement falls almost entirely on the backs of educators in the schools in the form of VAM-Powered Teacher Evaluations. There's little effort to improve the system. There’s no effort to improve classroom working conditions, provide professional development funding/resources, adequate material/resource funding. Instead of looking at how the system prevents excellence and innovation with its top-down mandates and many other ineffective measures, many states, including North Carolina and the Obama administration place accountability entirely and squarely on the backs of educators in the classrooms and schools. If the education system is broken, you don't focus on parts, you improve the whole. “Ranking teachers by their VAM scores can have unintended consequences that reduce quality.” If all learning that is important can be reduced to a one-time administered-bubble-sheet test, then all is well for VAM and the ranking of teachers. But every educator knows that tests measure only a minuscule portion of important learning. Many important learning experiences can't even be measured by tests. But, if you elevate tests in a high stakes manner, then those results become the most important outcome of the school and the classroom. The end result is teaching to the test and test-prep where the test becomes the curriculum. Getting high test scores becomes the goal of teaching. If that’s the goal of teaching, who would want to be teacher? Elevating test scores through VAM only will escalate the exit of teachers from the profession and discourage others from entering it. because there's nothing fulfilling about improving student test scores. We didn't become educators to raise test scores; we became educators because we wanted to teach kids. “The measure of student achievement is typically a score on a standardized test, and VAMs are only as good as the data fed into them.” Ultimately, VAMs are only as good as the tests administered to provide the data that feeds the model. If tests don’t adequately measure the content, or if they are not standardized or otherwise of high quality, then the VAM estimates are equally of dubious quality. When states try to scramble to create tests on the fly and do not develop quality tests, then the VAM estimates are of dubious quality too. North Carolina scrambled to create multiple tests in many high school, middle and elementary subjects just to have data to feed their EVAAS model. Yet, those tests and the process of their creation and field testing, even how they’re administered makes them questionable candidates for serious VAM use. VAMs require high-quality data to provide high-quality estimates. The idea that "any-old-test-will-do" is an anathema to VAMs which require quality test data. The American Statistical Association position statement on using value-added models in educational assessment makes some supporting statements about their use too. They can be effectively used as part of the data teachers use to adjust classroom teaching. But when a state does not return those scores until October or later, its impossible to use that data to inform teaching, three months into the school year. Also, just getting a rating does little to inform teaching. Testing provides an opportunity for policymakers to provide teachers with valuable data to improve teaching. Sadly, the current data provided is too little and too late. As the VAM-fed teacher evaluation fad and craze continues and grows, it is important for all educators to inform themselves about the controversial statistical practice. It is not a methodology without issues despite what the Obama administration and state education leaders say. Being knowledgeable about it means understanding its limitations as well as how to properly interpret and use such data. Don't wait for states and the federal government to provide that information: They are too busy promoting its use. The points made in the American Statistical Association’s Statement on Using Value-Added Models for Educational Assessment are excellent points of entry for learning more. While I am not sure whether this topic directly fits the needs of school leaders and educators, I have so enjoyed the sound the Bose Soundlink Mini provides so much, I just have to share it. Though please understand I am not a Bose or electronic salesman and I am not getting any fees for this post. Looking for a bluetooth speaker with an enormous sound is difficult, especially for someone like myself looking at the low-end devices, which just couldn't seem to provide a big enough and full enough sound. Yesterday, I found what I was looking for in a Bose Soundlink Mini. It provides me with exactly the sound as I was looking for, though for a bit more money than I intended. However, I discovered I just couldn't find a device for less to do what I wanted it to do. The Bose Soundlink Mini gives me a portable stereo, full range sound that I can literally can take anywhere. For example, I can't remember how many times during a presentation I wanted sound, but there were no adequate speakers in the room. For a small room presentation, the Bose Sound Mini provides a deep, rich sound that's just difficult to beat. It sounds good on the patio too! Here's some of my other favorite features of this device. Small and compact: At 2 inches tall, 7.1 inches wide, and 2.3 inches deep it is compact enough to fit into my computer bag. You can purchase a small case for close to fifty dollars. Can also connect with sound auxiliary cord as well. The Bose Soundlink Mini was a bit more expensive at 200 dollars than I originally intended, but it is a powerful little device. Of course the irony of the name of this charter school rings loud and clear once you read the grocery list of issues above. I have long understood that the theory most have about charter schools is to create schools that can avoid the red tape and regulation that regular schools face. Say what you want, but in regular public schools, it is fairly difficult for this kind of thing to happen. There are "pay scales" that control how much administrators are paid. There are regulations dictating how money is handled and paid. As much as we administrators might fuss about these regulations sometimes when we're dealing with administrative matters, this incident is a reminder that not all regulation is bad. When you create an governmental entity that can operate outside the rules the rest of us have to follow, corruption will follow. Now North Carolina has increased the possibility of more charter school corruption by lifting the ceiling, and we have a current United States president and secretary of education who are avid charter school supporters. Should we be really surprised when a charter school called "StudentFirst Academy," whose actual name sounds like it should be "Administrators First" suddenly becomes so corrupt that 300 students are cast into the street to find their education elsewhere? As a whole charter schools are no better than regular public schools. Their ability to avoid regulation is a recipe for more corruption and wasting of tax payer money like StudentFirst academy in Charlotte, North Carolina.